The Backwaters Press, 2005, 2006. He knows that this life is what we’ve got. That it is not something to be bragged up, nor to be made fun of. Yet it should be sung. And Reese sings it in plainchant, without filigree and ornamentation. 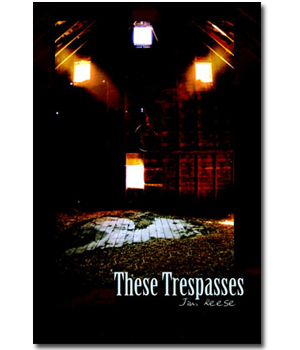 Reese’s collection of poems, These Trespasses,was recently published by Backwaters Press, Omaha. Some of the poems in the book appeared as “Saturday’s Poems” at The Middlewesterner, so you know I liked Reese’s work before I ever saw this book. … One can ascertain that Reese has lived among real people, has walked in their shoes, sat with them on their stoops and in their taverns, and listened to them. Listened well. Heard their stories and their speech patterns. These are “plain poems” in the best sense: sturdy and beautiful both, like Amish furniture. We only pass this way but once, and the journey is what you make of it, and Reese has chosen to make these powerful and moving poems out of the stories of our lives. He might be studying for a PhD yet his poems are “unstudied;” they are not the work of a naif, nor of a sophisticate pretending to be naive. Reese has the tools and he knows the tricks, knows the tricks well enough he doesn’t have to use them. He can let things be themselves; that is the beauty of simplicity. He is not clueless, but neither does he come off as hipper than those he writes of, nor hipper than his readers. As I say — authentic. Middlewestern. These poems are grounded in the stuff of this world, yet are never very far way from the music of our dreams. … That’s what these poems do — they hold on. The characters we meet, they hold on. The language of these poems holds on.